With this software you can manage all your favorite internet radio stations and listen to them by just a single click. But you can also record the streams and build your own skins! 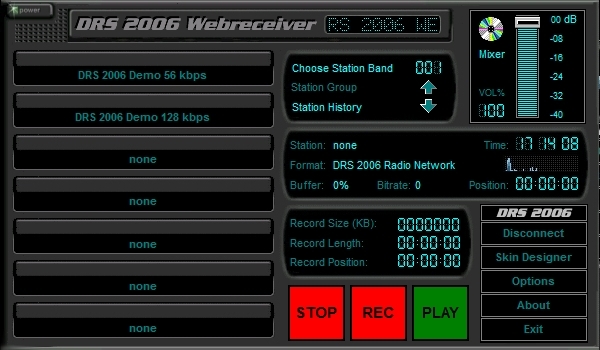 With the DRS 2006 Webreceiver you can manage all your favorite internet radio stations and listen to them by just a single click. You can define own stations bands and save the locations of unlimited radio streams. It also saves a history for most recently visited stations for quick retrieval of your favorites. Beside all these features you can also record any stream and save it on the fly. But that's not all. It also has many added skins you can chose. And you can even make your own skins with a simple to use Skin Designer. Real-time audio recorder with WMA, MP3, OGG, APE, FLAC and WAV formats support. Additional features include silent skip, audio cutter, recording schedule, audio cutter and more. This site does not contain serial number, crack, keygen DRS 2006 Webreceiver serial number : serial number is the simplest type of crack. A serial number(cdkey,product key,etc) is register the program as you may already know. a crack or keygen may contain harmful software. If you cannot find the exact version you want, just give it a try. for more information read .nfo/.txt/.diz file include in zipped file.